Although the official start of winter is still over two months away, parts of the I-95 corridor could see the first flakes of the year a lot sooner than that. As previously mentioned in an earlier WeatherWorks blog, the last week of October promises to bring a much chillier and potentially snowy weather pattern to the region. Despite the warm start to the month, plenty of cold air has been building across parts of the Arctic Circle, including Siberia and Western Canada. In fact, the total area covered by snow and ice across the Northern Hemisphere is up to 6.5 million square kilometers - an impressive 1.25 million square kilometers above average. Now that an abundance of arctic air is ready to be tapped, it's not surprising that a pattern change is looming. In fact, the latest guidance suggests colder air will invade the Eastern US within the next 5 - 10 days. 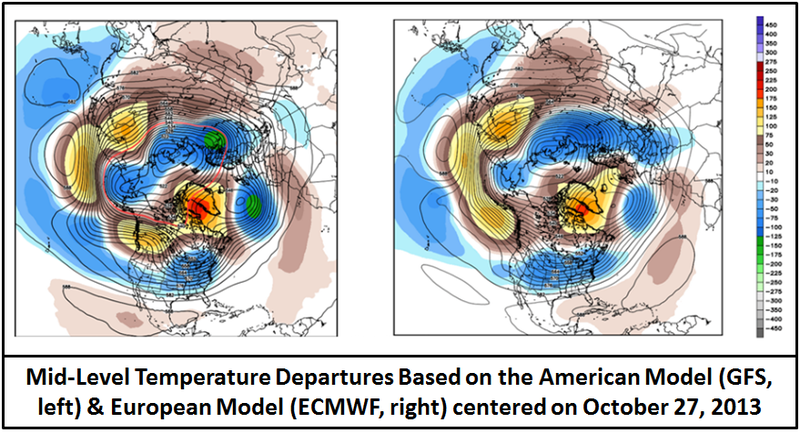 The image below depicts forecast temperature departures for the United States centered on October 24th through the 30th from the American Model (left) and the European Model (right). Note how both models show an expansive area of cooler than normal readings across the Midwest and Northeast. 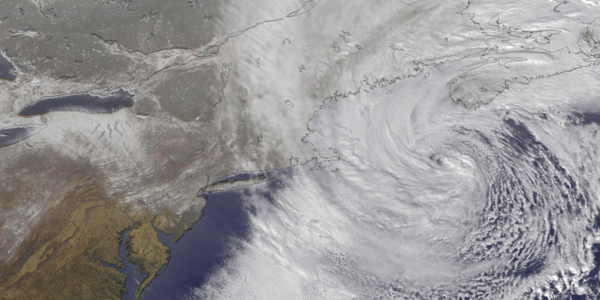 Additionally, both images depict a highly amplified (wavy) pattern, with a large trough centered across Eastern North America. Based on this, conditions will not only turn colder, but should also become increasingly active. As a result, there is a heightened potential for a winter storm during this period, with the main threat window ranging from October 25th through November 8th. For those of you who are snow lovers, it looks like the early start to winter will be a short-lived one. Milder air is expected to envelop most of the Eastern Seaboard by the middle of November, with few additional chances for meaningful snowfall through the end of the month. More in the way of variable conditions are expected as we head into December, as the I-95 corridor should serve as the battleground between milder maritime air from off the Atlantic and colder Canadian air to the northwest of the region. While there should be several opportunities for snowfall across these locations, the area most likely to see the biggest risk for significant winter storms will be the Midwest. 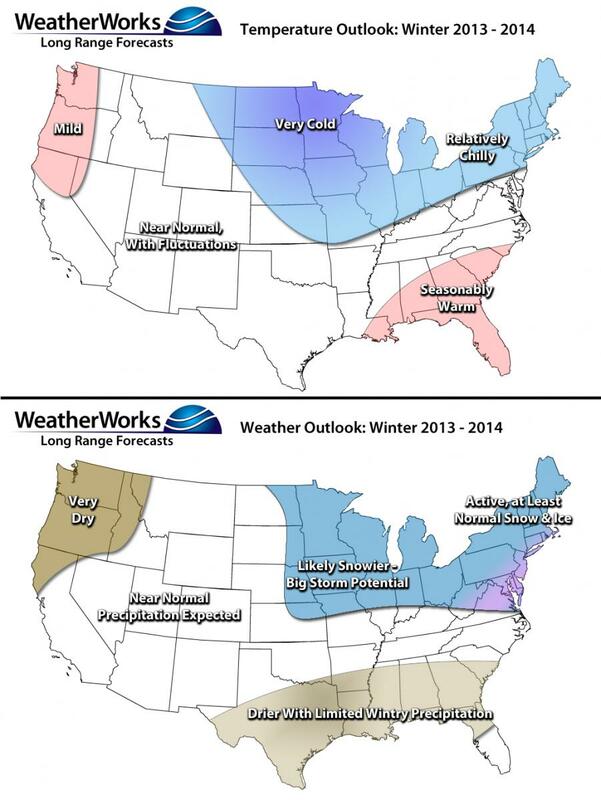 By the time we head into January, the winter season should really start to ramp up and persist into most of February. A combination of favorable atmospheric and oceanic circulation patterns along with support from several "analog" or "similar" years indicate that below normal temperatures along with a more active storm track will be the rule. This combination could set the stage for several big winter storm events up and down the East Coast, especially from late January into most of February. The following maps are based on a combination of the factors listed above along with both subjective and objective modifications to account for atmospheric teleconnection patterns. Below the maps is a list of take-away points for the upcoming winter. For a more detailed outlook, including a monthly breakdown, feel free to contact our Sales Department and find out about Winter Risk.